A top secret file of papers from Vnesheconombank (VEB) has leaked into the Moscow internet, disclosing a verbatim record of recent billion-dollar project reviews by the Russian state bank of last resort. The papers reveal that the multi-billion dollar Darwendale platinum mining project announced officialLy last month in Zimbabwe has been approved in “principle”, but no cash has been authorized. Not yet. The dossier records decisions by VEB’s supervisory board and deliberations by a working group of VEB executives and government officials from the Kremlin presidential staff; the office of First Deputy Prime Minister Igor Shuvalov; the staff of the Prime Ministry, the Finance Ministry, and the Ministries of Economic Development and Industry & Trade. No leak of decision-making of this sensitivity and at this level within VEB has ever occurred before. The VEB files appeared this week on an internet blog called “Blankering”. The original source of publication is a blog called Shaltay-Boltay (“Humpty Dumpty”), purportedly the work of a group of hackers calling themselves “Anonymous International”. They posted the materials on October 24 here and here. In July the Shaltay-Boltay channel was used to reveal papers from the office of Deputy Prime Minister Arkady Dvorkovich. In August, materials followed from the correspondence unit of Prime Ministry Dmitry Medvedev. Kremlin officials are treating the leaks as part of the information war over the conflict in Ukraine. 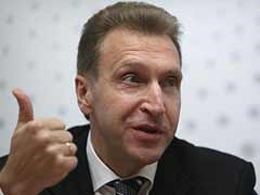 An accompanying note claims the files were slipped out of the correspondence unit of Deputy Prime Minister Shuvalov (right); he is the senior government official in charge of the banking sector. More documents are promised for next week. The documents released already include emails, computer screen shots, meeting records, and memoranda which have been circulating within VEB since mid-August. The circulation appears intended to develop an inter-ministerial consensus at the staff level, before the VEB board, chaired by the prime minister, will decide whether to go ahead with the proposed projects or not. 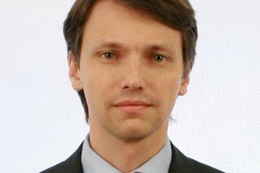 The lead executive responsible at VEB for the Darwendale project in Zimbabwe is the bank’s deputy chairman, Alexander Ivanov (lead image),son of Sergei Ivanov, the presidential chief of staff. The state holding called Russian Technologies (Rostec), headed by Sergei Chemezov, and a private entity called Vi Holding owned by Vitaly Mashitsky have been identified in Zimbabwe as the organizational brains behind the project. This duo are longtime friends, but they have no platinum mining experience. Mashitsky’s experience in international bauxite mining and aluminium production is small-scale and unprofitable, and has led to lossmaking, billion-dollar debts, and acrimoniuous litigation. A VEB analyst whose commentary is recorded in the dossier appears to recommend skepticism to the VEB board. In a report from a working group dated September 17, the analyst says: “In addition to the fact that in VEB in principle there is no money to fund such a project, and at such rates (6% in dollars),[there are] no other comments.” He was reporting to a VEB working group, headed by Daniil Agulyan (right), head of VEB’s Export Financing Department. 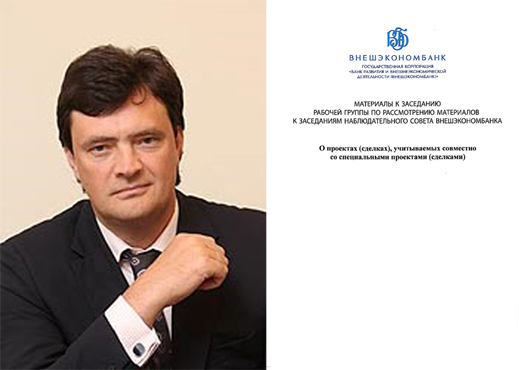 Joining Agulyan in the working group are Mikhail Poluboyarinov (below), first deputy chairman at VEB; E.S. Muslimov from the president’s office; and two officials from the Prime Ministry, M.A. Akimov and A. A. Grigorov. They agreed to “take note” of “the high importance of the project, as well as the Committee’s [the Committee on the export and foreign policy strategy of the Supervisory Board of VEB] decision on exports and foreign economic strategy of the Supervisory Board of Vnesheconombank of August 25, 2014 №2, and recommend that Vnesheconombank expedite examination of the project to put the issue of Vnesheconombank’s participation in financing it for considerationby the collegial bodies of Vnesheconombank.” Their report to the board, classified top secret, was due on October 15. The full Russian text of the preliminary report by the working group can be read here. The Darwendale refereence can be found on page 5.